If the engine is switched off automatically and you exit the vehicle, the engine is restarted automatically. The vehicle may begin moving. If you wish to exit the vehicle, always turn off the ignition and secure the vehicle against rolling away. The ECO start/stop function is only available for the G 63 AMG. The ECO start/stop function switches the engine off automatically when the vehicle stops moving. The engine starts automatically when the driver wants to pull away again. The ECO start/stop function thereby helps you to reduce the fuel consumption and emissions of your vehicle. 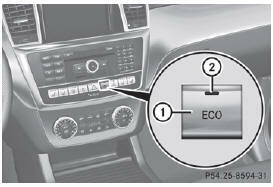 The ECO start/stop function is activated each time the engine is switched on. The ECO start/stop function is only available in drive program C.
symbol is shown in green in the multifunction display. In addition, the Stop/Start active message is shown in the AMG menu in the multifunction display. In addition, the Stop/Start inactive message is shown in the AMG menu in the multifunction display. The Stop/Start active or Stop/Start inactive message in the AMG menu in the multifunction display goes out. ► To switch off: press button : in drive program C.
or X Switch to drive program S or M .
► To switch on: press button 1. Indicator lamp 2 lights up. If drive program S or M is active, the automatic transmission switches to drive program C.
multifunction display. In addition, the Stop/Start active message is shown in the AMG menu in the multifunction display. this is the case, the ECO start/stop function is not available. In addition, the Stop/Start inactive message is shown in the AMG menu in the multifunction display. If indicator lamp 2 is off, the ECO start/ stop function has been deactivated manually or as the result of a malfunction. The engine will then not be switched off automatically when the vehicle stops. If the vehicle is braked to a standstill in D or N, the ECO start/stop function switches off the engine automatically. green in the multifunction display, if: • the indicator lamp in the ECO button is lit green. • no off-road program has been selected. • the vehicle is stationary. • the outside temperature is within the comfort range. • the engine is at normal operating temperature. • the set temperature for the vehicle interior has been reached. • the battery is sufficiently charged. • the system detects that the windshield is not fogged up when the air-conditioning system is switched on. • the driver's door is closed and the driver's seat belt is fastened. will be shown in yellow. green in the multifunction display. The engine can be automatically switched off an unlimited number of times. You can still activate the HOLD function when the vehicle is stationary, even if the engine has been switched off automatically. It is then not necessary to continue applying the brakes during the automatic stop phase. When you depress the accelerator pedal, the engine starts automatically and the braking effect of the HOLD function is deactivated. Depress the accelerator pedal carefully, as the engine must be started first. During automatic engine switch-off, the climate control system only operates at a reduced capacity. If you require full climate control capacity, the ECO start/stop function can be deactivated by pressing the ECO button . - you switch off the ECO start/stop function by pressing the ECO button. - you release the brakes when in transmission position D or N and when the HOLD function is not active. - you release the brakes when in transmission position D or N.
- you engage reverse gear R.
- you move the transmission out of position P.
- you switch to drive program S or M.
- you unfasten your seat belt or open the driver's door. - the vehicle starts to roll. - the brake system requires this. - the temperature in the vehicle interior deviates from the set range. - the system detects moisture on the windshield when the air-conditioning system is switched on. - the charge level of the battery is too low. Shifting the transmission to position P does not start the engine.